I didn’t want to start with this cliché, but Bond is back. This time, loaded with wrath in his heart, distrust in his mind and ammo in his gun. Instant hit Daniel Craig returns for his second performance in the first ever sequel to a bond film. And intriguingly Marc Forster takes the control of the Titanic, much to the concerns of the fans. And to negate the anxiety, the film has been shot in more locations than ever. So, does Quantum of Solace bring back the sheer fun of Goldfinger or does it bring the dreaded minutes of Die Another Day? Or plainly, does it have the licence to thrill? Quantum of Solace takes off from where Casino Royale (2006) left us with the most stylish Bond ending ever. Bond has just learned his first lesson – one of intense mistrust and callousness. He is shattered by Vasper’s (Eva Green) death and is sets out on a roaring rampage of revenge (sorry Kiddo!). With the help of Eva’s endnote (not another Bond pun!) and Britain’s own forensic service, he traces the whereabouts of Vasper’s extortioner which brings him to Haiti. Almost immediately, he meets Camille (Olga Kurylenko), a borderline femme fatale who herself is on a venture of personal vendetta and intends to avenge the death of her father. Bond finds out that she has close relations with an environmental activist Dominic Greene (Mathieu Amalric) and employs her to get to him. Greene says to Bond in one scene: “You make a fine couple – you are both, what is the expression? Damaged goods.” and that is what it is. Camille is Bond’s female counterpart in all sense of the term and equipoised as far as emotional state and instability is concerned. Both of them have lost the ones that they loved the most and both of them are determined to kill for personal relief. They feel tangled in a game they desperately want to finish. Bond helps alleviate Camille’s anxiety but she is unable to reciprocate, in spite of her wishes to free him from the vicious circle of survival and death. With the help of Camille, bond comes to realize that there is more to Greene’s plans than meets the eye. He tracks down Greene’s contacts, which reveals his unimaginable reach only affirming Bond’s now-natural suspicion. Almost as a generalization, it is the megalomaniacs in Bond films that make them most interesting. Of course, there have been genius inventions such as Goldfinger and Scaramanga and gross mishaps such as Dr. Kananga and Gustav Graves. But it becomes their unwritten duty to make the films quirky, perhaps even lovably cheesy and essentially make them disparate from contemporary franchises such as Indiana Jones or Die Hard. Though the character of Greene is grossly underwritten (like Renard of The World is Not Enough (1999)), it is a very interesting one. He is not a man with steel teeth or huge underground lairs. For heaven’s sake, he does not even carry a gun. But his short stature, the slight hunch and mafia-like charm has enough to make him seem formidable. But as they say in the business world, it is the result that matters. And Greene’s character remains underdeveloped and green (I’m really sorry for that one!). It is fascinating to see how the franchise has grown in the 46 years of its cinematic existence. From the incessant thriving on cold war and relationship with the Soviets in the Connery era, to chemical warfare and the space race in the Moore era, moving on to the post-Soviet world and the media’s intrusion in world affairs in the Brosnan era and the contemporary issues of terrorism and ecological threats with Craig, the humungous series has reinvented itself time and again to suit and sometimes succumb to the changing face of world culture and politics. The sexist tag on Bond has been discussed, M, a person with immense political power, has been made a woman, and Felix Leiter is now an African American, for crying out loud. All this is evidently a response to the gradual opening up of social outlooks of this mercurial world. In Quantum of Solace, Greene doesn’t even care about the exhaustive oil race, but for something more rooted in the future and something more dreadful to the human race as a whole – a global issue that has been getting worthy attention in a lot of films off late – although the plot isn’t even relished explicitly by the baddie and not even its consequences stressed upon (another uncharacteristic quality of a Bond film, where the evil plot is usually the driving force for the narrative). Bond finds out Greene’s plans which he executes with the help of the legal privileges of Medrano (Joaquin Cosio), a general who has been trying to overthrow the Bolivian government and the watchful eyes (or rather the absence of it) of the CIA. And like the narrative, Bond does not care much about it and his sole intention is propelled by his need for vengeance. The film’s basic premise reminds us of the Timothy Dalton starrer Licence To Kill (1989). Both follow Bond’s adventures as he sets out on a personal revenge in order to avenge the death of a beloved. And in both, the grim Bond is considered out of control and his licence to kill is revoked. However, in the older film, Bond never tries to kill almost throughout the whole film. Licence to Kill maintains a kind of tense atmosphere where the upper hand is gained by deceit and espionage and brutal action is but a luxury. And this is where Quantum of Solace itself goes out of control. Mr. Bond thinks by his gun and his primary objective remains dodging the next bullet. Much talk is going on about how this film is so uncharacteristic of Bond and how un-Bond the franchise has become (yes, I know. No “Bond, James Bond”. No Q, No Moneypenny. No “Shaken, Not Stirred”, No puns…). So has Bond lost his suavity and panache? Yes and No. One should see that the age of Connery thrived on the elegance of the lead and his funny but daring escapades. The style part of the film arose because of the way the character was written and the uninterrupted shots that filmed him. The franchise was more of a spy series than an action till the age of Brosnan after which there has been a marked difference in the way Bond has been catered to the audience. Probably, fuelled by the financial debacle of Licence to Kill, Eon productions was hesitant to perpetuate the series and it was not until 1995 (GoldenEye) that they realized that the character should be marketed differently, perhaps as an influence of the CG wave. And now, the style aspect of the film rises from the progressive technology and the way it is utilized to furnish the high mojo quotient to the series. So it is true that Bond now isn’t what Ian Fleming imagined him to be, but only as a inevitable necessity owing to the changing times. But having said that, there is definitely a scope for marriage of the two eras and decidedly a possibility of restoration of Bond’s lost magic. With a filmography that is highlighted by films such as Finding Neverland (2004) and The Kite Runner (2007), one wouldn’t place the odds in favour of the debutant Bond director Marc Forster. Perhaps, Forster himself was out on a mission – to prove that he is capable of experimenting with genres. The film seems Coppola-esque in a couple of scenes and Inarittu-ish in another, but maintains a Michael Bay-ian mindlessness almost throughout. High on action, with almost every alternate scene being a high octane automobile chase or a hand to hand combat, the average shot length for most part of the film is perhaps less than half a second and is at times (actually, many times) distracting. It feels like having no space to think or even breathe and of course, no quantum of solace. All of it seems acceptable when one is introduced to the third act. It looks as if the director has chopped off a good twenty minuets off the last act and as a result the whole showdown at the Bolivian desert feels abrupt and hurried. All said, what is the bottom line? Another high-flying action extravaganza in this year’s tryingly long queue is satisfactory. 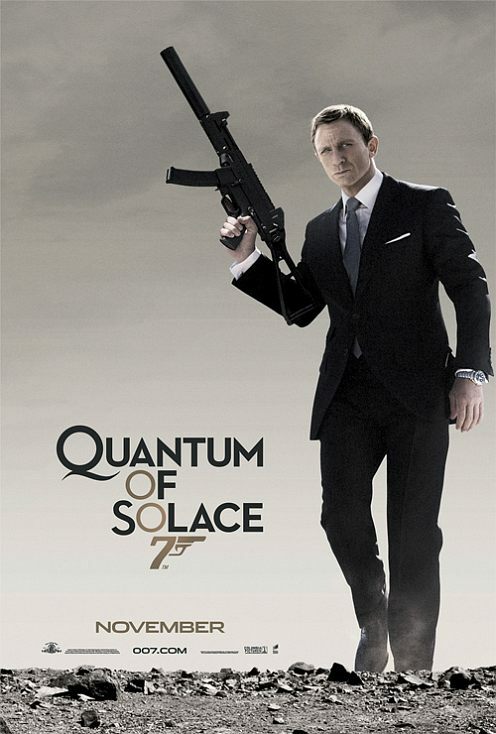 Not as refreshing as Casino Royale and definitely not as pathetic as Die Another Day (2004), Quantum of Solace is a good film to watch for people who are new to Bond and they wouldn’t have any reason to complain (By the way, the film has a snazzy title track by Jack White and Alicia Keys). But for guys who have been boasting about Bond countdowns and ranting about the best and the worst of Bond, better stick to Connery! P.S: This brings me to the end of the long and mostly enjoyable Bond marathon. Hope you enjoyed it too.